Loans-Now takes up the challenge of providing fast and innovative finance solutions for both personal borrowers and business borrowers. 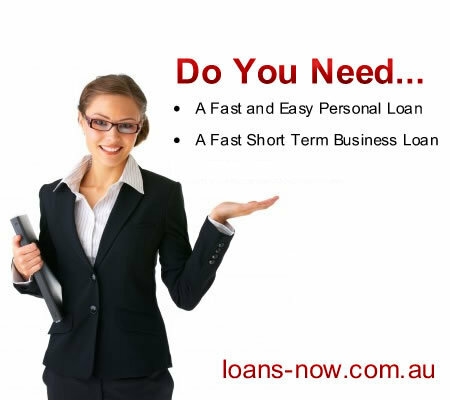 From fast personal loans to fast short term business loans, we can arrange it all for you you. And its as simple as applying online, and within hours you will have an answer. This enables clients from anywhere in Australia to quickly arrange a loan from the comfort and convenience of their home or office..
At Loans-Now, we can assist people in a range of situations. Whether you've had credit issues in the past or are finding it difficult now, or if you are wanting to consolidate your finances into one easy loan, or if other lenders have said "No", we may have a fast and simple finance solution for you! Simply click on which loan type you're after, then APPLY ONLINE using our fast and simple OnLine Application.